The Agency’s last fiscal year ended March 31, 2018 with the Canadian Beef Cattle Check-Off revenue totaling $7,701,203 on cattle marketed. This income was received at $1.00 per marketed head in most provinces, except Nova Scotia, New Brunswick and Prince Edward Island, who collected $2.50 per head for at least part of the 2017/18 fiscal year. Since then, British Columbia, Alberta, Saskatchewan, Manitoba and Quebec have also come online with a national check-off increase to $2.50, and the Agency continues to work closely with the provincial organizations to facilitate the increase from a grassroots level. 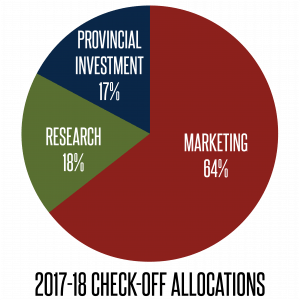 Of the total check-off funds collected of cattle marketings in the last fiscal year, 64 per cent was allocated to market development and promotion, 18 per cent to research and 17 per cent was retained by the provincial cattle organizations for regional marketing and research programs. Issues management, recently renamed Public and Stakeholder Engagement, continued as a pilot program last year under the Agency, for a total of $95,239. The Import Levy on beef and beef products imported into Canada was also collected at a rate of $1.00 per head equivalent, for a total of $947,730. 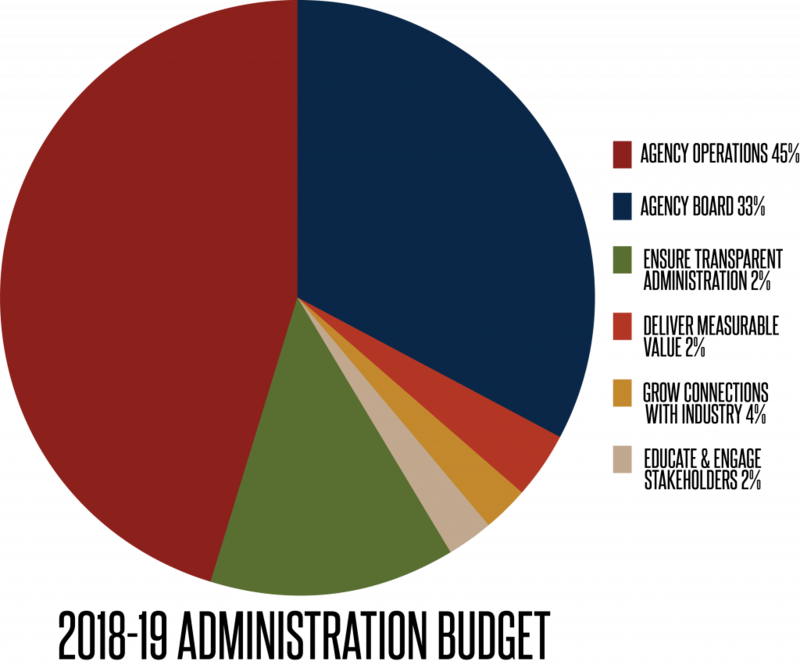 These funds, net administration, are allocated to Canada Beef for the sole purpose of generic beef marketing such as nutrition marketing, recipe development and culinary skills education.A 2018 report showed that on average from 2014/15 to 2016/17, every dollar invested from the import levy resulted in a benefit cost ratio (BCR) of 6.42:1 or a $6 of benefit. In addition, domestic generic beef marketing activities funded by the import levy are currently providing a higher BCR than the average marketing and research activities. The average BCR for the import levy grew from 2.34 in 2014/15 to 9.92 in 2016/17. This implies that despite positive benefits, under-investment continues for the industry. Last year $600,611 was retained for the administration of the check-off, the Agency and the Board of Directors. The Agency continued its focus on transparent administration of the check-off, communication and updating the agreements with our provincial cattle association partners. Collection and service agreements were updated with all provinces, which modernized language of the agreements to better align with each organization’s current structure. A focus on maintaining transparent and separate finances from Canada Beef was also a strong priority, with the Agency beginning to move towards a completely independent finances and accounts to conduct all levy and administration transactions through.We spent much of the year continuing to develop and refine a strengthened set of by-laws, which encourage a structure more aligned with the needs of the provincial cattle associations. The amendments have been driven by a desire for a more transparent separation of governance of the Agency’s administration and marketing programs. With the amended by-laws enabling a more robust Marketing Committee to oversee the strategies, business plans and operations of Canada Beef, the Agency continues to move towards the distinct governance that the funders have been seeking.It was through the provincial funders that we were able to reach out across the country to ensure each province was getting the support and dedication to check-off administration that was needed. The Agency had the privilege to be invited to four provincial annual meetings, six Check-Off Town Hall meetings and speak to over 600 producers and industry stakeholders regarding the investment of Canada’s national check-off. The Agency recently launched our first stand-alone check-off website at cdnbeefcheckoff.ca. The website facilitates communication between producers, provincial and national partners and the Agency, and aims not only to answer some of the most frequent check-off questions, but ensure that stakeholders have a place to access frequently updated information regularly on how check-off is being invested. The latest news section is dedicated to sharing up to date information on strategies, programs and activities that are supported by check-off dollars. Many producers will still have questions about the recent Canadian Beef Cattle Check-Off increase that took place in most provinces, as well as funding allocations, return on investment, and how the check-off is administered. First and foremost, we encourage you to talk to your provincial cattle association, or your provincial association representative to the Agency, about how your province collects and remits the check-off, and how your province plans to allocate the check-off between research, market development and promotion, and public and stakeholder engagement. We also encourage you to visit cdnbeefcheckoff.ca regularly for the latest check-off stories, and to sign up for our monthly newsletter, The Gatepost. Through these channels, our social media presence @cdnbeefcheckoff and through our provincial and national partners, the Agency will continue to provide measurement and report on progress so the return on investment for the Canadian Beef Cattle Check-Off will be clear to producers across Canada.